Objectives: To determine whether the intramaxillary relationship of patients with Muenke syndrome and Saethre-Chotzen syndrome or TCF12-related craniosynostosis are systematically different than those of a control group. Material and methods: Forty-eight patients (34 patients with Muenke syndrome, 8 patients with Saethre-Chotzen syndrome, and 6 patients with TCF12-related craniosynostosis) born between 1982 and 2010 (age range 4.84 to 16.83 years) that were treated at the Department of Oral Maxillofacial Surgery, Special Dental Care and Orthodontics, Children’s Hospital Erasmus University Medical Center, Sophia, Rotterdam, the Netherlands, were included. Forty-seven syndromic patients had undergone one craniofacial surgery according to the craniofacial team protocol. The dental arch measurements intercanine width (ICW), intermolar width (IMW), arch depth (AD), and arch length (AL) were calculated. The control group existed of 329 nonsyndromic children. Results: All dental arch dimensions in Muenke (ICW, IMW, AL, p < 0.001, ADmax, p = 0.008; ADman, p = 0.002), Saethre-Chotzen syndrome, or TCF12-related craniosynostosis patients (ICWmax, p = 0.005; ICWman, IMWmax, AL, p < 0.001) were statistically significantly smaller than those of the control group. 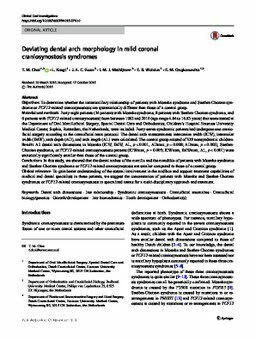 Conclusions: In this study, we showed that the dental arches of the maxilla and the mandible of patients with Muenke syndrome and Saethre-Chotzen syndrome or TCF12-related craniosynostosis are smaller compared to those of a control group. Clinical relevance: To gain better understanding of the sutural involvement in the midface and support treatment capabilities of medical and dental specialists in these patients, we suggest the concentration of patients with Muenke and Saethre-Chotzen syndromes or TCF12-related craniosynostosis in specialized teams for a multi-disciplinary approach and treatment.